E is for: Endive, the perfect low-carb "cracker"
Today's post is more of an idea than a recipe. I had an extra head of endive leftover from my Escarole, Endive & Radiccio Salad I made earlier in the week for National Salad Month and wanted to use it up. (By the way, did you know it's pronounced "on-deev"? So fancy-sounding). There is a whole website dedicated to this delicate little member of the chicory family. There, you'll find recipes, and nutritional information about the vegetable. Among the many health benefits, they are loaded with valuable vitamins and minerals such as vitamins B and C, calcium, magnesium, iron, zinc, folate and selenium. Remember my Neufchâtel & Smoked Salmon Endive Boats I made back in January? 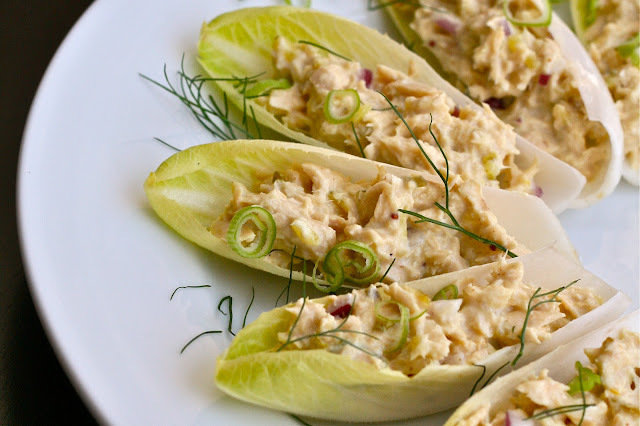 I loved the way the endive spears served as a crunchy, low-carb alternative to a cracker. I opened my fridge and spied some canned tuna...so I thought tuna salad would be the perfect accompaniment. Spoon it into some endive leaves, garnish with some sliced green onion and dill, and serve! This is great as part of a healthy lunch, but would also work well as an appetizer for a bridal shower or girls TV night. Of course, the possibilities are endless. 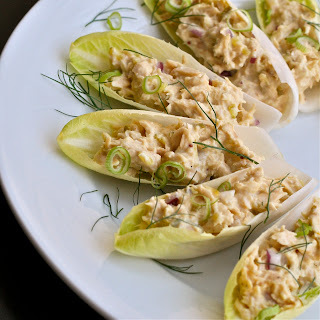 Here are a few more ideas for endive spears: Asian Turkey Lettuce Wraps....using the endive leaves instead of lettuce. Would be great as a party appetizer! Of course, the aforementioned Neufchâtel & Salmon appetizers are another option. Or how about my Chicken Salad with Cherries recipe? What about you? Do you have any interesting endive recipes to share? If so, please leave it in the comments section below. Mix together and serve in endive leaves! You're right about endive for small servings of prepared salads; I use it for Dungeness crab salad. Your recipe for tuna salad is very close to mine; 'cept I use sweet pickle relish, some fine chopped celery and add a few dashes of tumeric to the salad. It really adds something without obscuring any of the other flavors. I'm willing to bet you'd like it! WOW....crab salad sounds ah-mazing. Might have to try that soon! Great idea to use Endive as a cracker! I'll definitely try it sometime. I don't do the whole low carb thing strictly, but I like a lighter vegetable heavy lunch. I m very glad to read all the information about the low carb diet.This is one of the amazing low carb cracker,great food carvings that you have been mentioned here.Keep sharing more about low carb food.There are low carb salmon patties, this is baked salmon patties low carb that is much beneficial for your health.